Every visitor to Madrid should step inside Retiro Park. It’s a wonderful centrally–located 125-hectare park. Its name refers to its function under Philip II’s rule – it was a place from which to escape from the rigours of the court life. There’s so much to see: from the beautiful architecture, to the fun of the row boats on the pond and of course, Madrid’s oldest tree – the 400 year-old taxodium which is often referred to as a cypress. Keep an eye out for the Judas tree also – which gives great colour. You might like to visit the Forest of Remembrance which consists of 192 olive trees and cypresses surrounded by a channel of water – to mark the tragedy of 11/3/2004. Keep an eye out for the many events such as antique book fairs and literary festivals that are located inside the park. And if you want to be like the locals, you’d better pick up a packet of sunflower seeds (pipas) to munch on as you walk around. We’ve included Retiro Park in our post on The 10 Thing We Love in Madrid. 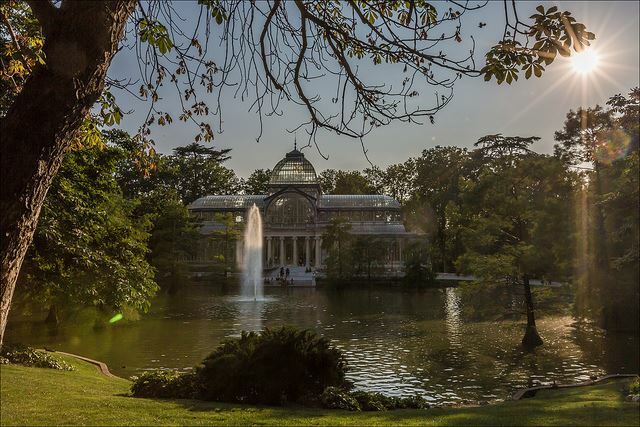 The Botanic Gardens are national reference point for the study of Spanish flora, you’ll find the 261-year old institution right beside the Prado Museum. Its 8 hectares of beautifully tranquil gardens and exhibitions offer a great retreat from the busy city centre. In terms of trees, you’ll find yew, pine, elm, hackberry, cypress, pomegranate, linden, copper beech, oak and cedar. 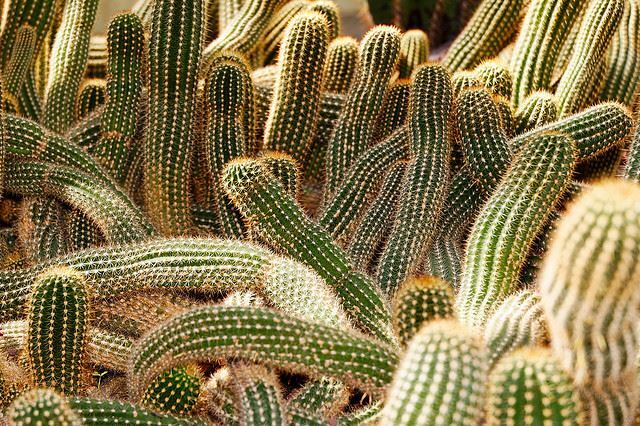 You’ll also enjoy the bonsai collection donated by former prime minister Felipe Gonzalez, the Olive Tree Avenue, the rose gardens, and the cacti in the Greenhouse Exhibition space are amazing. The Sabatini Gardens and the Campo del Moro gardens which are near the Royal Palace are great green spaces which offer lovely glimpses of the palace. We also love the grounds of the Museo Sorolla (a perfectly intact painter’s studio) which is a beautiful enclave of calm and creativity. 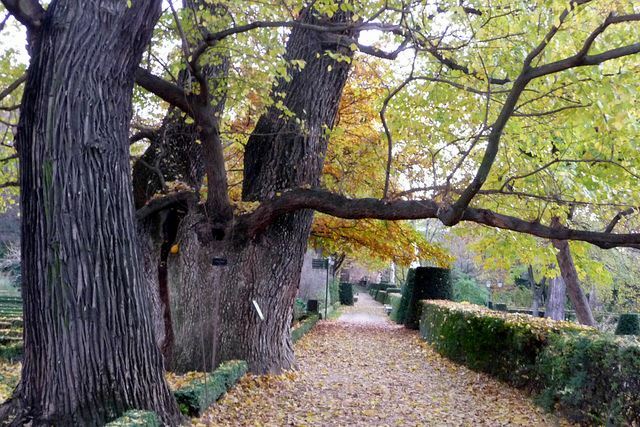 And if you are in the north east of the city (near the airport) we recommend the 14-hectare El Capricho Park which was the home to the Duke of Osuna – a major patron of Goya. You’ll find a labyrinth, parterres, play areas for children and much more. 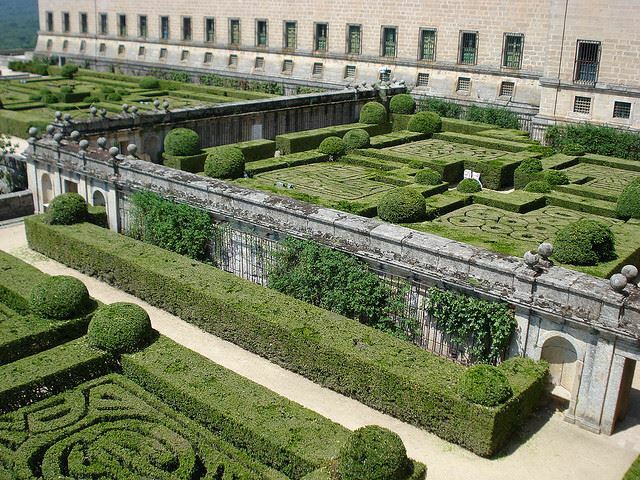 Don’t forget the El Escorial Gardens – the source of much pride for Philip II. The UNESCO-listed monastery and Royal Palace was completed in 1584 and, just 45km from the centre of Madrid, it’s a popular day trip from the capital. You can see the three gardens – the King’s Garden, the Friars’ Garden and the Convalescents’ Gallery. And Aranjuez Royal Palaces, 42 km south of the capital, in the region of Madrid. It’s a luscious area – thanks to the irrigation from the River Tagus. The Palace and grounds were commissioned by Philip II. The old quarter of Aranjuez is an impressive example of Baroque town planning. The garden highlights include the woodland avenues of the Island Garden, the floral displays of the Parterre Garden, and the variety of trees in the Prince’s Garden. A great day trip from the capital. Read more about this and other day trips from Madrid here. The Generalife was a summer palace for the Nasrid Emirs of the Emirate of Granada in Al Andalus built in the early 14th century. 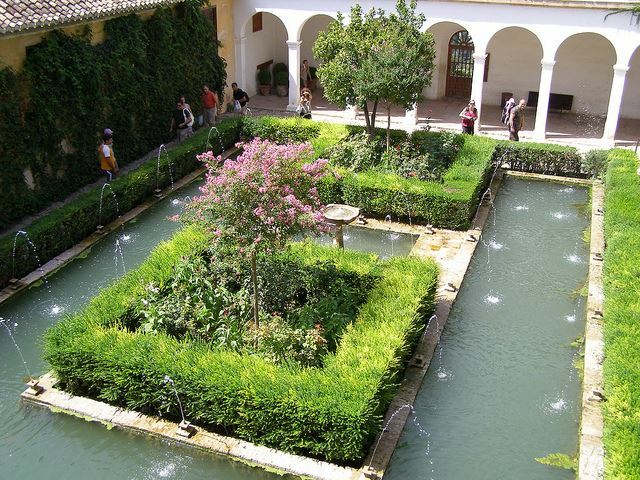 It is one of the oldest surviving Moorish gardens and a great example of a water garden. 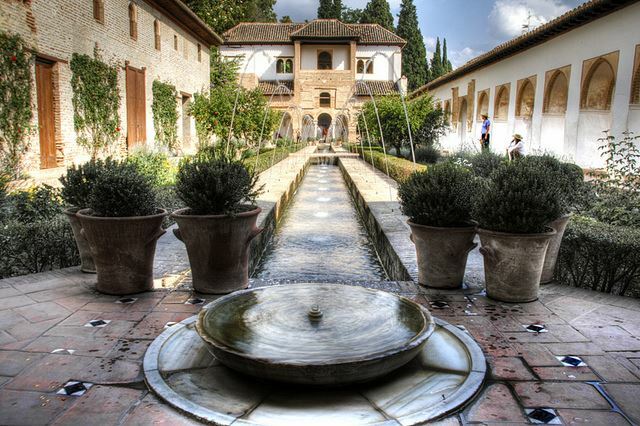 The Irrigation Courtyard (49m x 13m) is the most important part of the Generalife and really stops you in your tracks. But there are so many elements to enjoy in this garden – the wonderful and varied mosaic pathways made from pebbles, the light and the sound of the fountains, the Four Rivers of Paradise representing water, milk, honey and wine. And the lovely dense cypress hedges. The orange trees give great scent and colour. 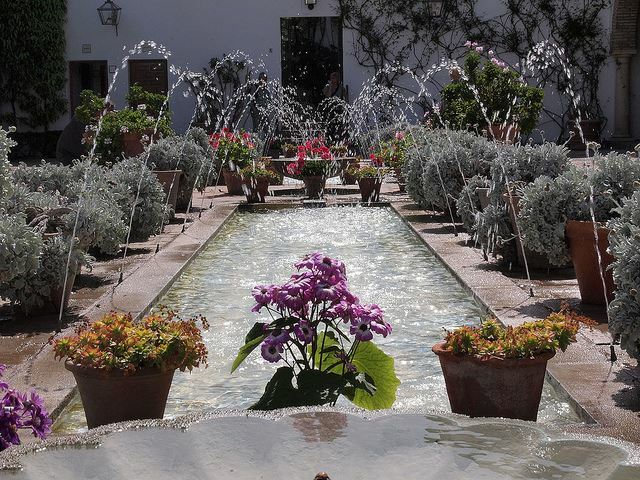 The Patio de la Sultana is another important courtyard – its water is connected to the Royal Canal that serves the water for the Generalife and the Alhambra. And don’t miss the parterres in the upper gardens. Go early because you won’t want to leave. 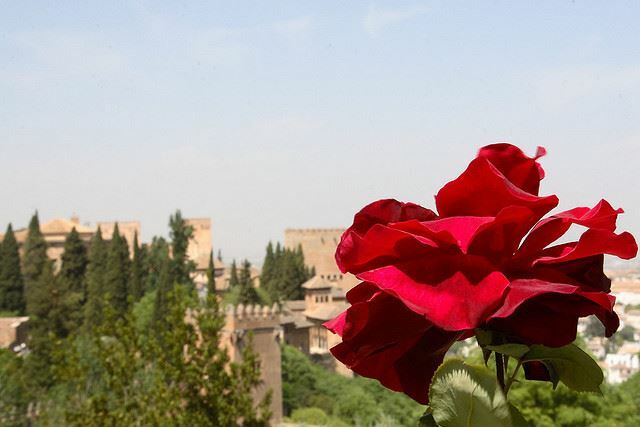 Before you travel, check out ‘Nights in the Gardens of Spain’ which was composed by Andalusian Manuel de Falla, and one of the three movements is set in the Generalife gardens in Granada – you can listen to the piece here while you read our guide to visiting the Alhambra & the Generalife. Walking inside this fortress or castle’s grounds is like stepping inside history. 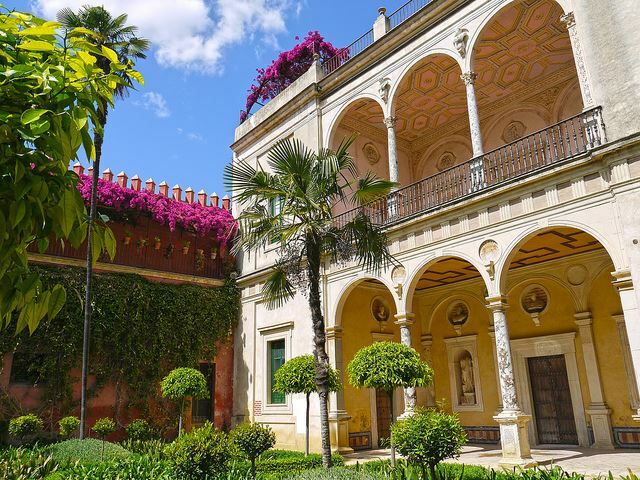 Every period from the Arabic to Mudejar, Renaissance, Baroque and more are on show in this centrally-located UNESCO-listed site that is still used by the Spanish Royal Family when in Seville. The courtyards are stunning. It’s structured gardens are a riot of styles and don’t be surprised to see some peacocks strutting their stuff. 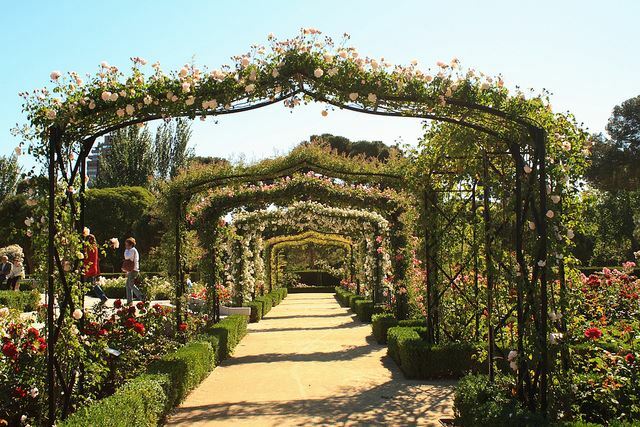 The main gardens are the Charles V Garden, The Flower Courtyard, The Dance Garden, English Garden and Poets Garden. Enjoy the scents as you walk around too – citrus fruits and herbs. Watch out for the mosaics as well. This is a place where you can walk around at your own space and stop and start as you wish – as there is no fixed walking route. Go early. We cannot recommend these stunning courtyards highly enough. Whilst not strictly gardens in the way most people would understand the term, these shared-spaces serve the same purpose. 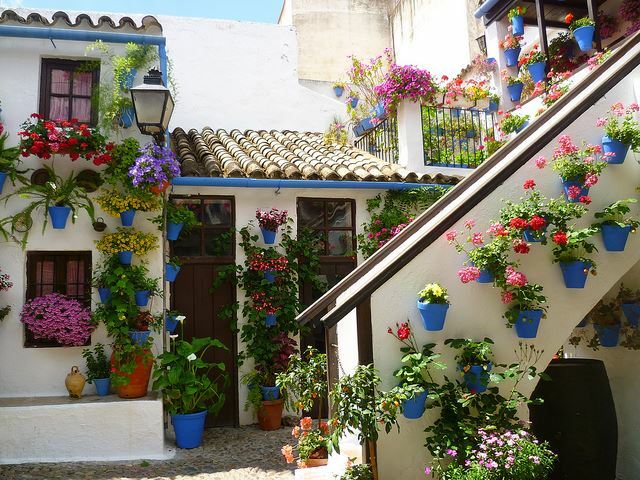 The UNESCO-listed patios offer a glimpse of real Spain, as most are maintained by their own communities. We recommend a visit to the Palace of Viana which has a dozen courtyards and gardens. And don’t miss the smaller and more private spaces in the old city centre. Cordoba runs a festival and competition for the best patio every year in May – we’ve written about it here. 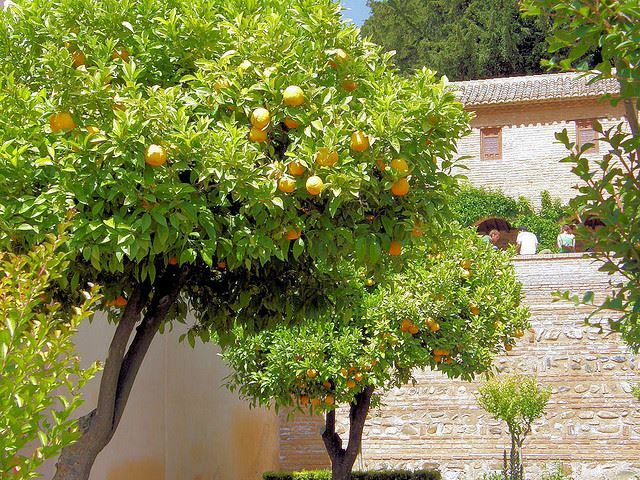 7 Other Great Gardens to Explore in Andalusia? We would recommend a visit to some of the quieter and more private residence such as 15th century Casa Pilatos in Seville owned by the House of Medinaceli. It’s a stunning blend of Mudejar, Renaissance and romantic styles. The well-maintained gardens feature fountains, ‘loggias’, ponds and hedged paths. A hidden gem in the heart of Seville. 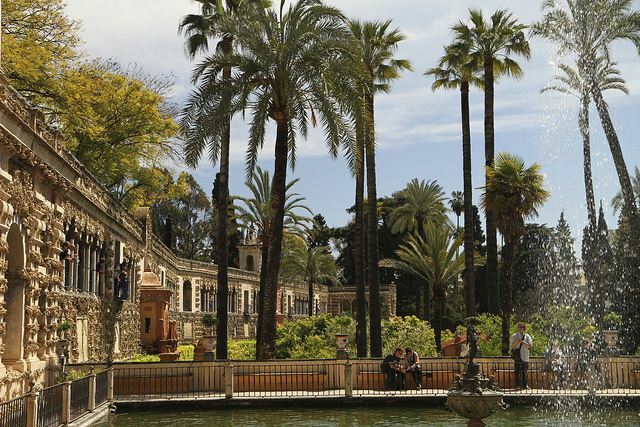 And you should also see the Maria Luisa Park in Seville – designed by French landscape architect Forestier. It’s the city’s most visited park where you’ll see walkers, joggers, rowers and horse-drawn carriages exploring this large park best known today for its Plaza de España built for the 1929 Expo that pops up in Lawrence of Arabia and Star Wars. 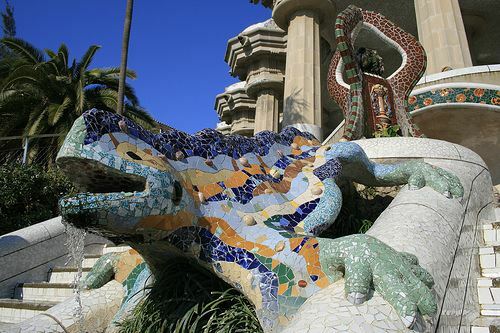 We love Gaudi’s wild combinations of influences (Romanesque, Moorish and Gothic) and materials (ceramic tile and rough stone sculptures). The curved paths, the mosaic animals, the iconic park benches and bridges that cross over each other at different levels are fascinating. The park has some of the best views of the city. Whilst botanists may not find this the most interesting of outdoor spaces, it’s impossible to do anything other than admire the craziness and creativity of this park that is over 100 years old. We have written about the Park and why it’s so worth a visit here. You should also read our guide to Gaudi’s Barcelona here. 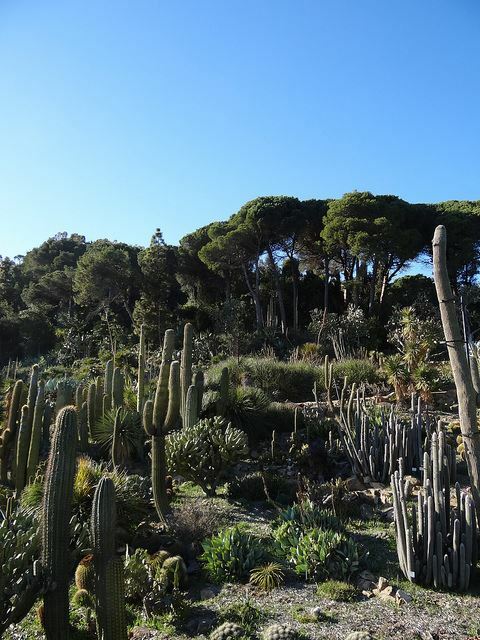 If you are looking for a garden on the coast, you won’t find better than the Marimurtra Botanic Gardens on the Costa Brava. 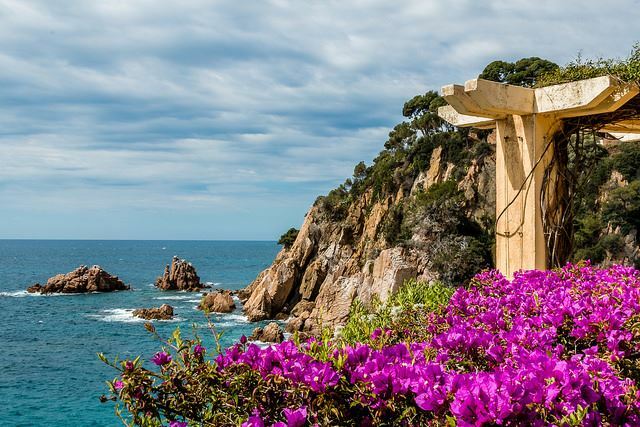 6km from Lloret de Mar and 1 hour drive from Barcelona, these gardens were created in 1920 by German businessman Karl Faust who was very interested in biology. Today, still run by the founder’s private foundation, you’ll find over 3,000 species, mainly Mediterranean and sub-tropical flora as well as a research and conservation centre and 10 hectares of forest. 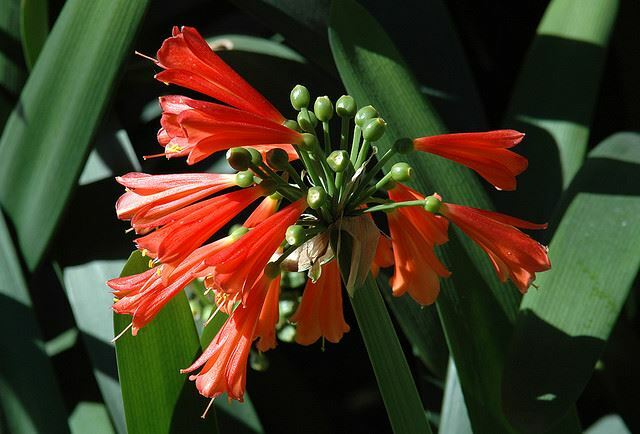 Keep an eye out for the Chinese Pittosporum palm tree, the Paliurus, sour-berry and Garrya X Thuretti shrubs and the forest saffron evergreen. Enjoy meandering around the gardens on winding paths. Don’t miss the Linnaeus Temple. And did we mention the amazing sea-views already? 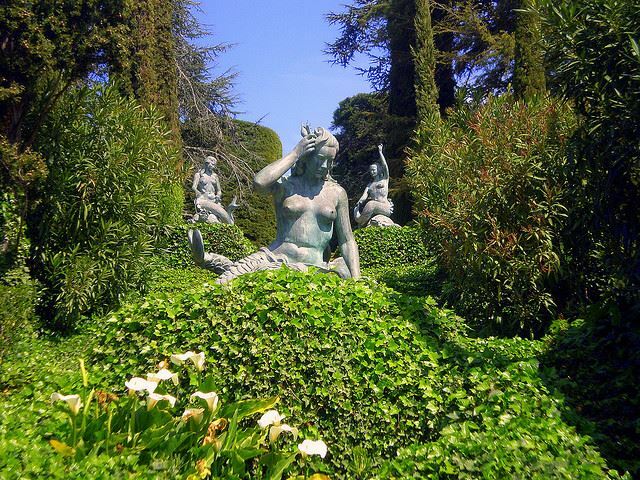 Dating from 1927, the cliffside Santa Clotilde garden beside Lloret de Mar is best known for its statues, fountains, evergreen trees and shrubs. (This garden which is just a few km from Marimurtra dove-tails very well as it is more about architecture than botany). You’ll enjoy the cypress trees which give lovely structure and the scent of orange blossom when in season is heavenly. 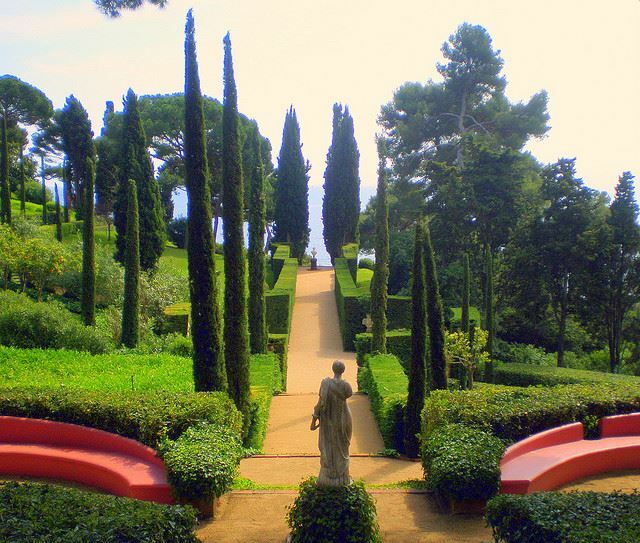 These Italian renaissance styled-gardens were designed by well-known architect Nicolau Maria Rubió i Tudurí who was also director of Barcelona’s parks and gardens from 1917-1937. The garden was commissioned by the Marquis of Roviralta for his wife. You should bring a picnic as there is nowhere to purchase any food or drink and you’ll find lots of benches and sun-loungers as well so come prepared with some time to relax and soak up the views. 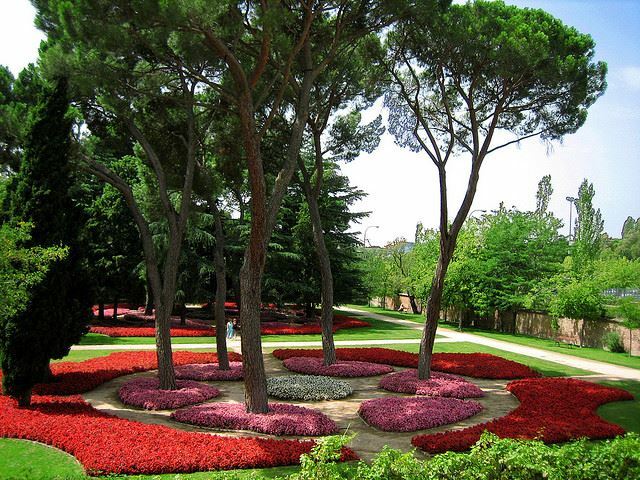 11 More Great Gardens to Explore in Catalonia? 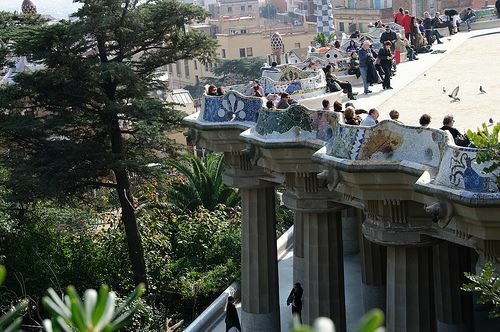 How can you visit gardens in Catalonia without seeing the surrealist outdoor works of Dali at the Theatre-Museum in Figueres, the castle gardens at Pubol, and the house museum in Portlligat near Cadaques? While there, visit the Cap de Creus national park which inspired many of his works. You can read our guide to Dali’s Catalonia and our guide to Travelling the Costa Brava here. For a more mainstream experience in downtown Barcelona, we like Parc de la Ciutadella in the city centre. 12 Don’t forget to include one of the National Parks in Spain. And take a visit to a local farm or winery! You should really read our guide to the amazing (and varied) 10 natural parks on mainland Spain to get a real sense of the native flora and fauna and appreciate the colours and the open countryside. A perfect contrast to the busy and formal gardens we have detailed here. We would also recommend a visit to an artisan food producer or farm – for example a winery, an orange farm, an olive oil producer or an Iberian pig farm. Read about the agri-tourism trips we’ve organised. 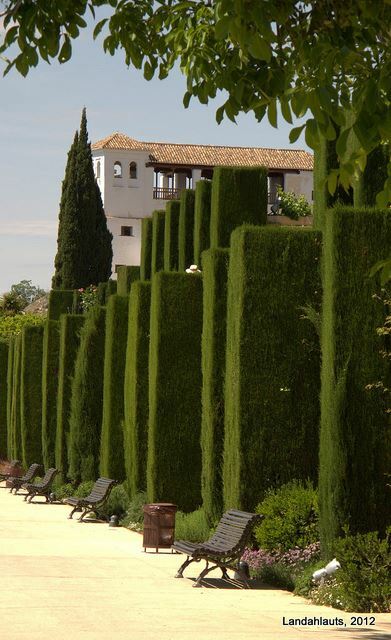 13 When to Visit These Great Gardens in Spain? 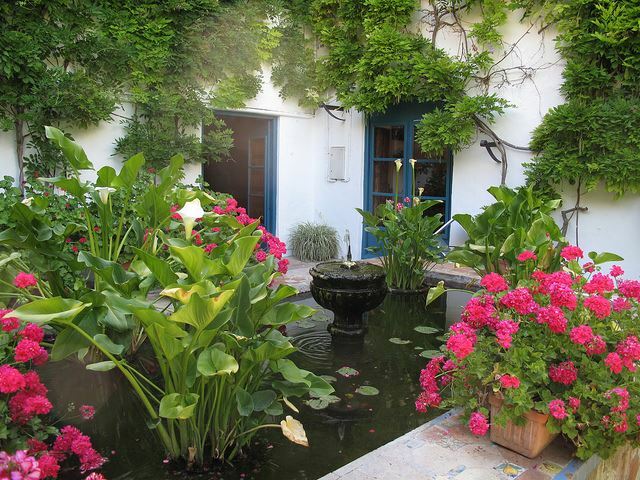 Instinct and practicality will tell you that the gardens in the South of Spain will be best seen in Spring. That said, there is still plenty to enjoy from the gardens in the hot dry summer months as they have been designed to provide respite from such warm temperature. And even in the Autumn there are seasonal treats in store. 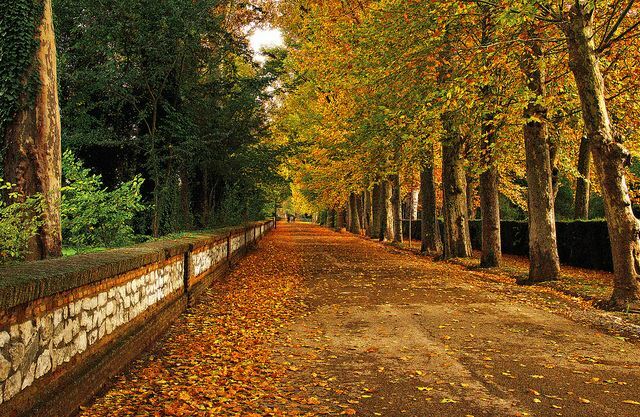 In Madrid, Spring is also best but its dry climate makes for a very pleasant Autumn and Winter break also. In Catalonia, it’s also good to travel in Spring but even if you have to travel during Summer, Autumn or Winter, you’ll still find lots to enjoy and explore. 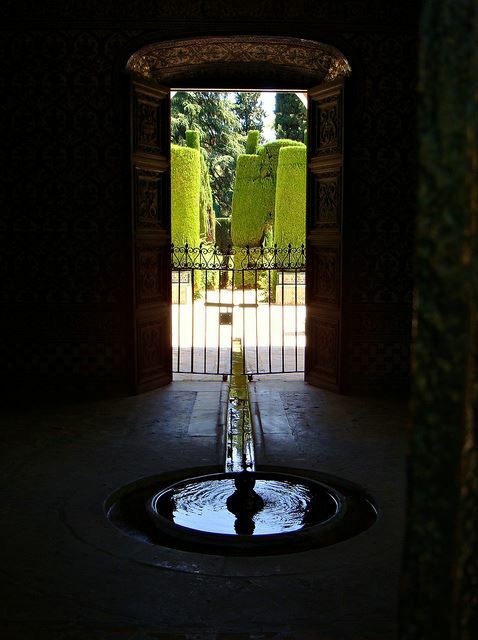 14 How to Travel around these Gardens in Spain? Pro-tip: We recommend the AVE, Spain’s high-speed train to travel swiftly from Barcelona to Madrid and Seville. Locally, we can arrange car-hire at each of the main cities or book private drivers to get you from garden to garden. We can also book our expert private guides to reveal the beauty and history of each individual garden. Read our guide to the high-speed train in Spain and the benefits of hiring private drivers and guides in Spain. Posted in Active breaks, Andalucia, Barcelona, Castles, Catalonia, Cordoba, Dalí, Gaudí, Granada, Insider Spain Guides, Madrid, Madrid Region, Museums & Galleries, National Parks, Popular Posts, Seville and tagged Andalucia, Aranjuez, Blanes, Botanic Gardens, Cap de Creus, Casa Pilatos, Cordoba, El Capricho Park, El Escorial, gardens, Generalife, Granada, Lloret de Mar, Madrid, Maria Luisa Park, Marimurtra, palaces, Park Guell, parks, patios, Plaza de Espana, Pubol, Retiro, Royal Alcazar, Santa Clotilde, Seville, Spain, Viana Palace.